I got most of my inspiration for my vintage alphabet nursery idea from looking at blogs and websites for inspiration. I found the animal alphabet at 'Hip and Humble' and then decided it would be cute to hang them as if they were on a clothesline. I had seen other blogs where they hung art in a similar way. It turned out to be a very inexpensive way to decorate an entire wall. The wall above the crib was inspired by my sister who came across some 'old school' school work images on flickr. I also found some of my own school work from preschool, kindergarten, etc. I bought a bunch of Ikea frames and arranged them on the floor until I figured out how I wanted them to go up on the wall. This was also an inexpensive wall to decorate since Ikea frames are so cheap and getting the pictures printed was cheap too. I found the bedding and the fabric to recover the rocking chair at a fabric store in New York called Purl Soho. I just saw both the fabrics and fell in love with them. My mom is a talented seamstress and she recovered the chair, made the bumper pads, skirt, window valence, and quilt. I was thrilled with the results. The crib is from Target, I found the dresser in the classifieds, the rocking chair at a tag sale and the foot stool from Elemente. The nursery really came together the last 2-3 weeks before my due date (yes, I procrastinated). I gathered ideas and bought different items throughout my whole pregnancy, but I really didn't get things going until the end. It was really fun and easy to put his room together. I think the most time-intensive part is just finding things that inspire you and figuring out how to incorporate them into a room. I really wanted his room to be a place that I enjoyed spending time in and I wanted it to stimulate him as well. Alphabet Cards on a clothesline! I LOVE this! Where did you get the clothesline? I love love love this nursery and I was wondering 2 things: how did you decide on how high to paint the stripe and how did you hang the string(rope) for the clothes line? Cutest nursery ever! What a lucky baby to have such a great mom!!! This is the cutest nursery in the world! I love it!!! So beautiful and in a totally understated way, Looks like a very calming space. I love it. Thanks for sharing Kellie. I love the colors in your nursery and the alphabet wall is so original. Well done! Return to Your Nursery Ideas. If you're having trouble getting started with your baby room, don't miss my nursery decorating guide: Nursery Design Step-by-Step. 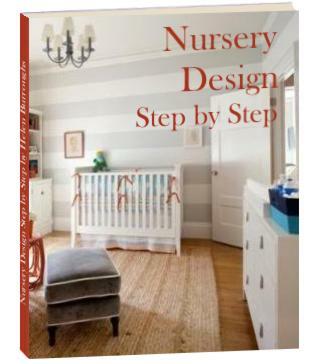 Nursery Design Step-by-Step is a 105 page nursery design guide with over 100 nursery pictures to help you with planning your baby room, choosing a baby room design and implementing your nursery decorating project. One at a time I'll take you through all the decisions you need to make in order to arrive at the best baby room design for you. enter our baby nursery photos contest. Send us your baby nursery pictures - you can win some great prizes! Then grab some Baby Room Decor Supplies and get started!